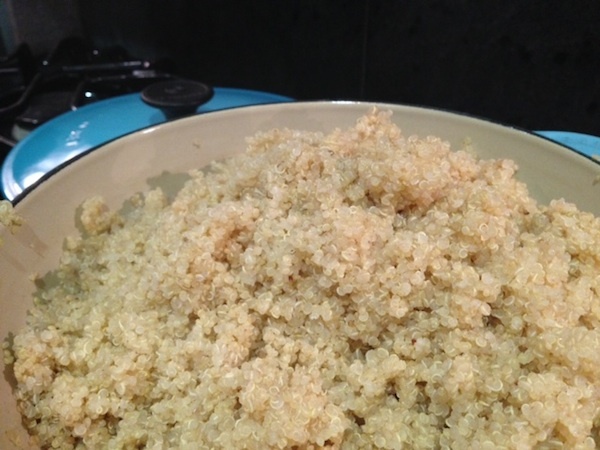 Quinoa! Feta! Lemon! Vegetables! Chicken! A recipe. | Britt Does Fit. First day of school for ingredients! First you’ll want to bring 4 cups of water to a boil with a dash of salt. 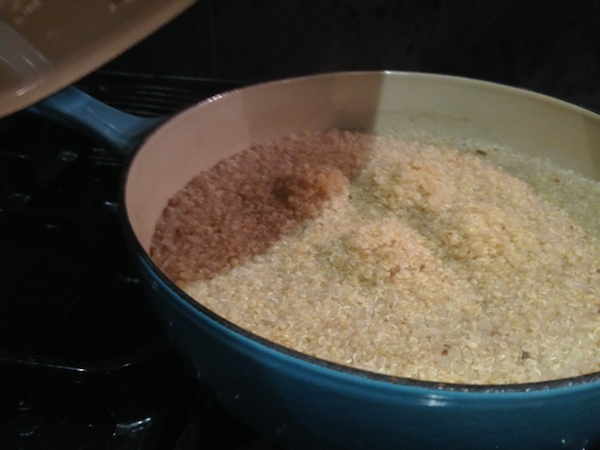 Add your 2 cups of quinoa, stir it in with the water, and then set the heat to low for 15 minutes. 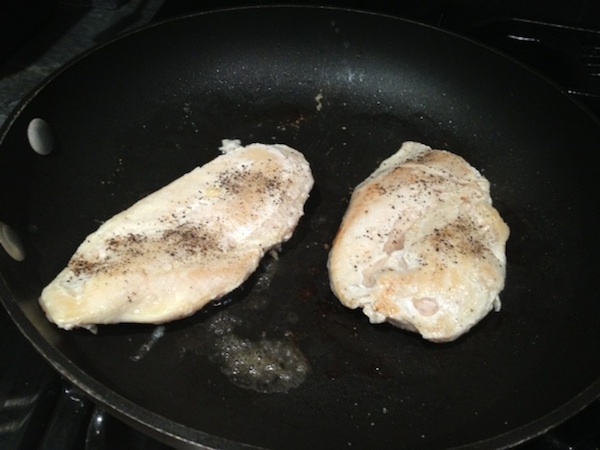 Now WHILE THAT IS HAPPENING, heat a Pam-Olive-Oil-sprayed pan and cook your chicken breasts for about 4 minutes on each side, salt and peppering each side. Here is a live action shot of that. Now set that chicken aside, and add 2 tablespoons of oil and the chopped onion to that same pan. 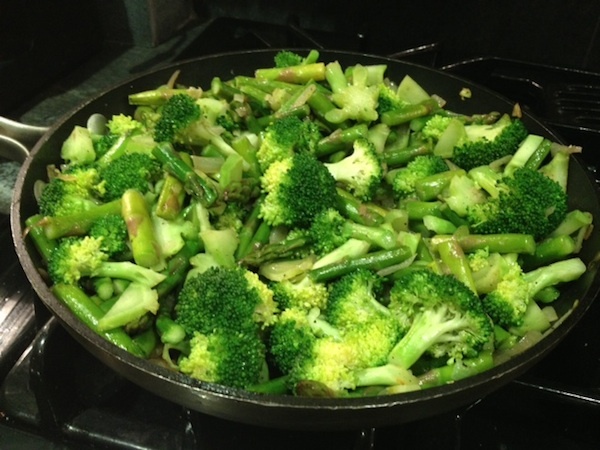 Saute for about 5 minutes, and then add in the asparagus and broccoli stems — not the florets yet, because we don’t want soggy vegetables. That’s nasty. Also, add a little salt and pepper. You’ll want to remove it from heat, cover it, and let it sit for another 10 minutes. MEANWHILE, taste the asparagus / broccoli stem / onion concoction. The asparagus should still be a little crispy, but not tough. If it’s tough, give it a few more minutes. If it’s good to go, add the broccoli florets. You’ll want all of this to saute together for about 4 more minutes or so. While you’re waiting on the quinoa, cut the chicken breast into cubes. Luckily you let the chicken “set” so it should be more moist? I don’t know, something about not cutting it right after you cook it or whatever. Anyway, now it’s perfect, and OH LOOK, SO IS YOUR QUINOA. It’s been standing for 10 minutes, so now you just want to “fluff” it with a fork (just scrape it around and stuff). 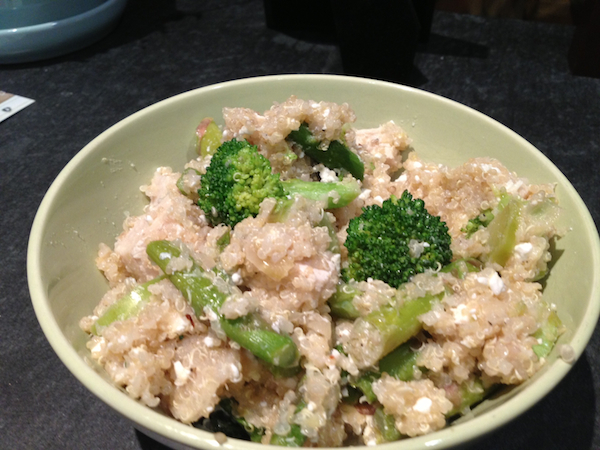 Now put the quinoa, cooked veggies, feta, cottage cheese, lemon juice (from the lemon and a half, maybe use 2 if you like a lot of zing), chicken, truffle oil (or olive oil if you don’t have it) and a few shakes of crushed red pepper. Here’s all that stuff. Now mix it up! And put some in a bowl so you can eat it. This serves 5 or 6 and is really filling (and I don’t say that about ANYTHING) and super good for you. We’ve already talked about how quinoa is in itself a complete protein, and adding a little chicken breast just gives you an extra lean protein booster (since you worked out so hard today). 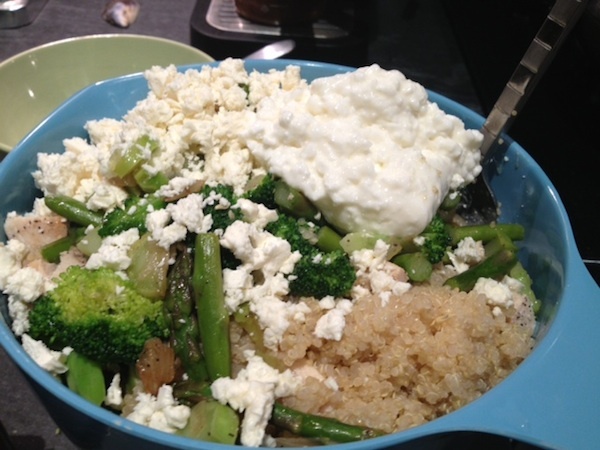 PLUS, instead of using 8 ounces of feta, we used 4 oz feta and 4 oz 2% cottage cheese, and it tastes JUST AS GOOD, maybe even better because it’s a little creamier. Anytime a hot recipe calls for feta, try substituting some of it with cottage cheese — you’ll still get a great cheesy salty fix, but with a little less fat and a little more protein (man there is lean protein all OVER this thing). 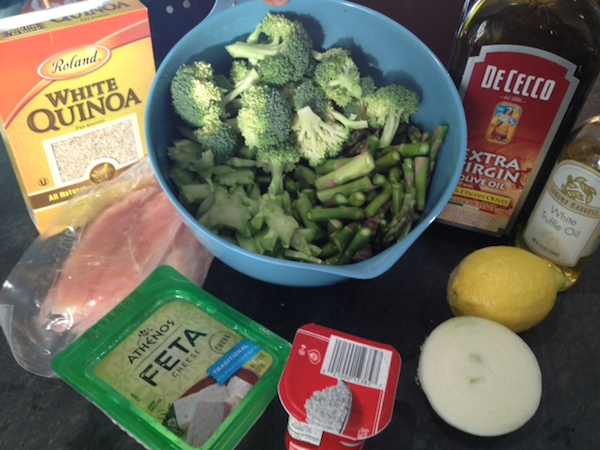 Also, quick trick, you can opt for a half portion of this, and mix it with a nice lettuce mix with a lemon and olive oil dressing. Quinoa mixed in with a salad (lettuce salad, not mayo salad) is actually really great, the textures go well together and quinoa is just as tasty cold or at room temp. Now you have the same amount of food, but mostly lettuce so you’ve cut your calories almost in half, AND you have plenty of leftovers. Neat!